With all of the extreme winter weather this year, many are planning to get away if a break in the weather appears. 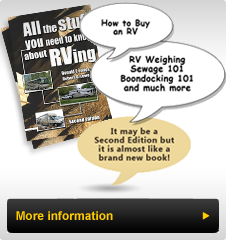 It is always best not to drive a RV in the winter for a number of reasons, one of which is the long term damage that will occur from the corrosive effects of the chemicals used to melt ice and snow. There was a time when the chemical of choice was simply road salt - calcium chloride. We watched the salt trucks spin off the salt as they drove down the road. We would do our best to avoid following one of those trucks. Modern methods involve using chemicals often far more corrosive, some applied prior to a storm to pre-treat the road and cause falling snow to melt. These chemicals can do serious damage to a vehicle unless thoroughly cleaned off, soon after exposure. Recently I received a memo from Spartan Chassis Corporation that provides a good summary of the chemicals used, the harmful effects and ways to mitigate their effect on the vehicles including RVs. The ideal prevention is not to drive in winter weather, however if that is not possible this article will give recommendations to reduce the damaging effects of winter chemical application.